If you've been following me for a while you'll know how much I love buying things from Amazon Online, I buy everything from there. I really do think it's a great website and its an awesome way of saving money too as you can find a lot more things cheaper on Amazon than in high street stores. I was put to the test of creating an Autumn Amazon Look Book for five autumn looks and this is what I came up with. All of these looks I would wear myself and have even bought some of these to wear too. I love the lace, I love the shabby chic looking tights, I love the studs on the ballet flats, I love the owls. The only problem I have with this is that I can't wear normal ear rings and have to buy clip ons, but thankfully these owl earrings come in clip on versions too. This look is my favourite, this is all me. 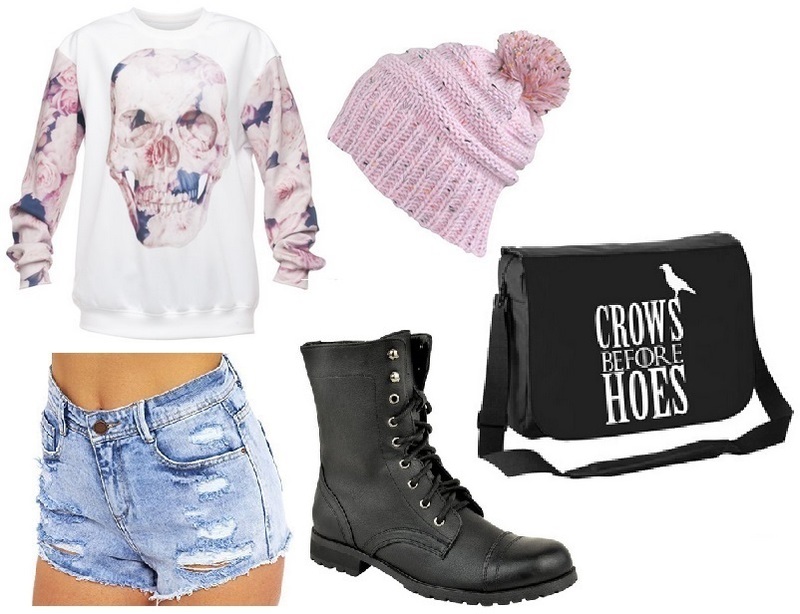 Skater skirts, gothic style purse, bobble hats; I am buying this whole outfit as I really do love it all so much. 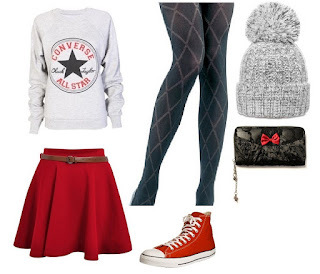 I think the red converse really do just make the whole outfit complete. This is my second favourite look. As you may tell already for me accessories in autumn time are all about the red detail. I really, really love the vintage gothic choker with this outfit and the pattern on the skinny jeans just makes the whole thing look so girly and beautiful. I thought I would change the red up with this and put in a more pastel tone so what better than my favourite colour of pink? 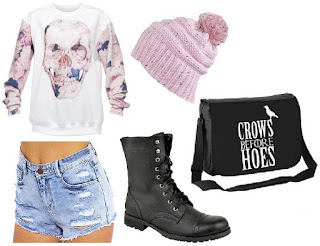 I love these boots (I have boots really similar that I wear so much) and the rose design on the skull jumper just makes this whole outfit girly-gothic. Also, who doesn't love this Game of Thrones bag? Amazing. 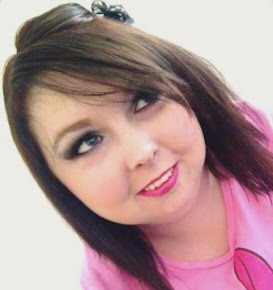 This is my more grown-up kind of look. Although the black heels don't come with anything shown on this picture I wanted to keep them to give you all an idea of how you could wear heels with this outfit for more of a evening or night time look, and the beautiful riding boots as more of a shopping day or park day autumn look. I want to add that I own this bag in white and I was very surprised at how small it actually is inside, there isn't much room inside so don't let the picture fool you. I really hope you like at least one of these outfits, and it gives you some idea's on what I am going to be wearing this autumn time and gives you a little bit more information on my style as I don't do many fashion or style blog posts any more. I'd love to know what you all think so please let me know by leaving a comment below or by tweeting me. Such beautiful outfits! I don't think I could pull any of them off though. I especially love the tights in outfit 1 - so cool! i loved the converse one, OMG i need that jumper in my life! I love the owl necklace and earrings! They're so cute!